The first record by the Duo Dryades, Kirmari, drew attention through the vividness and virtuosity of the playing. In the meantime, Mari Mäntylä has brought out at least one decacorde solo album. Owing to the ten strings of the decacorde, this instrument has a special mellowness in its bass notes. The starting point for the Speira album was to record new music that is custom-made for the Duo Dryades. This idea conceals also a risk; nothing familiar is given to the listener as a point of reference. The album opens with Sonatina Palimpsestica by a French composer Vincent Bouchot. A palimpsest is a manuscript on parchment, from which the original text has been scraped off and a new text has been applied. One should find two layers in the composition: the surface and the remains of the underlying old text. The music is inventive and has exiting sounds in it. Promenades is a small-scale suite by German Sid Hille, now resident in Finland. The music describes affectionately the composer’s former places of residence in France. This divertimento-like composition unfolds easily to the listener. There is something surrealistic or even oppressive in the whirls of Iiris Kosonen’s Mariatyyri. Speira (chrysalis, spiral) by Pekka Jalkanen includes meditative passages and musical condensations. An excerpt from a hymn by Limenos from the time B.C.E. has served as source material for the composition. In his composition, Jalkanen has taken an ancient Greek spiral ornament as a model, hence the name of the piece. In the chinking arpeggio chords of the decacorde one may imagine echoes of the Greek lyre. As a counterweight, the climax of the first part strikes almost violently. The second part is an intimate, yet powerful song of the guitar. The third part is a virtuosic and boisterous cavalcade of rhythms from all over the world. Finlandia by Harri Wessman serves as the tonal dessert of the record. Originally a song cycle, Mäntylä and Kuusisto have made up an instrumental duet version of it. Lapones leads us to South America, Ritmos further away to some place in the Balkans, Tango marches and longs for Russia, and finally, one expects that the finishing part Verano will find its way to Finland, but it bursts into Latino rhythms as well. It is a pleasure to listen to the playing of this duo. On its new Speira CD the Duo Dryades has collected music that has been specifically composed for this pair of instruments. The composers of the album are Sid Hille, Vincent Bouchot, Iiris Kosonen, Pekka Jalkanen and Harri Wessman. All these composers have interiorized in a remarkable way the fascinating sound sphere of these two instruments and this has resulted in a musically variable and interesting record. This impression is emphasised by the fact that the musicians of the Duo Dryades seem to be on the same musical wavelength. The playing has clear-cut outlining and the interpretations are brave considering both nuances and tempos. A bandoneón-decacorde duo is an extremely rare, if not a unique, ensemble. In the hands of Kristina Kuusisto and Mari Mäntylä it proves to be a viable combination. The accordion that has become known through the Argentinean tango and the 10-stringed guitar meet in a fruitful crossing of influences with backstreet melancholy, modern timbre effects, classical technique, fiery accents, energetic rhythm and jazzy casualness. The title track Speira by Pekka Jalkanen, stands out as the fullest and mellowest of all the compositions, whereas Sonatina palimpsestica by Vincent Bouchot appeals to the listener with its fragile vibration. The Promenades by Sid Hille resound with an unstrained simplicity. Finlandia by Harri Wessman charts his native Finland with affectionate melancholy, but with a twinkle in his eye. In its first recording, the Duo Dryades comes close to the aesthetics typical of the ECM New Series. The soulful bandoneón of Kristina Kuusisto and the profoundly sonorous decacorde, the ten-string guitar of Mari Mäntylä create an organic sound that draws shades from tango nuevo, art music and jazz. The overall ambience of the recording is supported by the specially commissioned and well-prepared programme, which entwines a determined and subtle, yet an easily approachable whole. The long cooperation and spiritual sisterhood of Kuusisto and Mäntylä is clearly heard in the Bouchot’s Sonatine, in which they render the flickering visions smoothly. The Mariatyyri by Iiris Kosonen is made of more emphatic stuff, but thanks to the light and rhythmically precise playing, an air of tranquillity prevails throughout the piece. Ingenuous and technically crystal bright playing make the late Impressionism of Sid Hille and the pseudo-oriental moods of Pekka Jalkanen convincing. The most convivial offering of the record is the four-part suite Finlandia by Harri Wessman, in which an entertaining Latin-Americanism sheds a light of jovial irony on the title. An exceptional duo, which seduces with its skilful performances. The performances of the duo are excellent, and both of the musicians generate fine tones out of their demanding instruments. The close collaboration of the duo with contemporary composers is a pleasant fact, which has resulted in a new repertory for this exceptional ensemble. 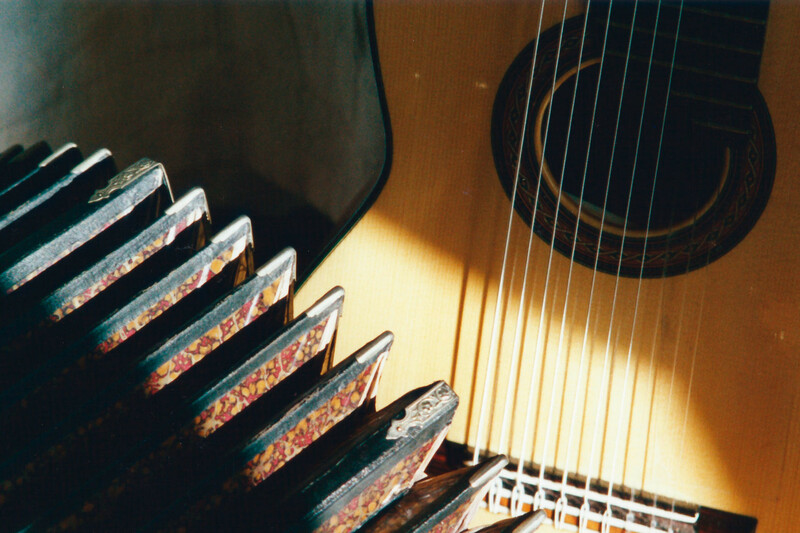 Two rarely played instruments – the bandoneon and the decacorde together, create a fine combination of timbres. The duo of Kristina Kuusisto and Mari Mäntylä has released a great album. It has only taken a combination of two surprisingly versatile instruments and two devoted musicians to create a spectrum of amazing tonal variety. Two subtle instruments and thoroughbred musicians offer an intensely undergoing and experiential musical journey for their listeners. Here, we deal with music that extends far beyond the limits of everyday idioms. It represents a new and delightful “third stream”; music that is capable of integrating both popular and folk music with art music. The real clue of the recording is in how they have made these pieces of music sound. Their collaboration flows like crystallised thought, spiced with warm emotions. The recording of a rarely heard ensemble is original and refined. The chamber music collaboration flows naturally and promptly with sensitive reactivity. Mäntylä’s playing has a rich touch and sound and her technical accuracy is flawless. It only takes listening to the first Piazzolla bass progression and you will already be covered in goose bumps. The inexhaustible and always appropriate shades of sounds of the Kuusisto bandoneon will not allow the listener to slacken for a single moment. Finally, the first and foremost feature of a quality recording: it becomes better and better on each listening. You will be able to hear both the passion of the Argentinean tango nuevo, the gaiety of Breton folk music and the original melancholy of the Finnish spirit – the effect is tremendous. The concert by the Bandoneon Decacorde Duo of Kristina Kuusisto and Mari Mäntylä left no one untouched. The sphere of sound offered by the recording is thrilling and colourful. The instruments are united with their sounds in a fabulous way and the hearing experience soothes the soul of the listener. Kirmari is a strong and versatile whole. For the major part, the material of the album represents compelling moody shades; however the duo is also capable of delivering more vivid expressions. The combination of the fieriness of a Latin tango country and the iciness of the Scandinavian home land of Kristina Kuusisto and Mari Mäntylä is probably the key to the the number of applauds heard during this musical evening at the Al-Bustani festival. Presentation got a powerful applause from the public! Loc Envel, Duo Dryades enchanted the audience of 150 listeners. In as magical atmosphere as ever in Loc Envel, the Duo Dryades truly ravished the massed audience who had come to listen to the pair of virtuosic masters of the bandoneón and the décacorde. These two Finns, Mari Mäntylä and Kristina Kuusisto, played Argentinean tango, Breton folk music and naturally, Finnish polka. The listeners were swept away by the magic of the music, while the chapel could not even accommodate all those who were willing to come to the concert. Mäntylä and Kuusisto are true virtuosi in the proper sense of the word. Apart from their virtuosity, they are full-blooded musicians who have created a seamless joint musical will during their collaboration as a duo. Their playing is often a true gourmandise of elaborate details, which create an elegant whole at the same time. During the brilliant evening of Kuusisto and Mäntylä, the musical information and feeling dovetailed perfectly. The evening was fresh and cleansing, the musicians were brilliant, the composition of the programme was palatable and the audience was delighted. In short, the evening offered the caressing of souls without any barriers. The first performer of the concert, the Bandoneon Decacorde Duo of Kristina Kuusisto and Mari Mäntylä was an exquisite surprise. The bandoneon was charged with rich nuances and the ten-stringed decacorde guitar of Mäntylä projected effective vigour. The musical landscapes of the duo stretched from South America to the northern homelands of the polska dances of Scandinavia.